The first five troops in Torrington interacted directly with the national office, through its Field Department in New York. However, there were troubles with this arrangement. The Scouters in the established troops only received answers to program and policy questions by writing to the national office. To maintain this arrangement, the national office would need to hire an army of bureaucrats. Additionally, the New York office could not possibly know about all the potential troop sponsors, much less devise a way to recruit them. To come up with a solution, the national office used the same sort of franchise type system that worked with troops. Each community organization, which chartered a troop, chose a representative. These representatives then joined together with other interested men to become members of a local council. The national office offered two options, a First Class Council managed by a paid professional Scouter, or a Second Class Council managed by a volunteer Commissioner. Implicit in this agreement was that if a community opted for a Second Class Council, it would ultimately advance in rank and hire a professional. Regardless, the troops could receive unit service locally, whether or not the council program was organized under a Council Executive or a Commissioner, all without adding to the piles of unanswered mail in the Field Department. In March of 1917, Torrington Scouters and other supporters met with Carl Northrup, the Waterbury Council Executive. The men present showed the varying interests in the Borough of Torrington, not just the delegates from the YMCA, the Episcopal Church, the Congregational Church, and the Methodist Church, but also lawyers, merchants, tradesmen, and manufacturers. With Northrup’s help, they elected to form a Second Class Council and set out to recruit a Commissioner. 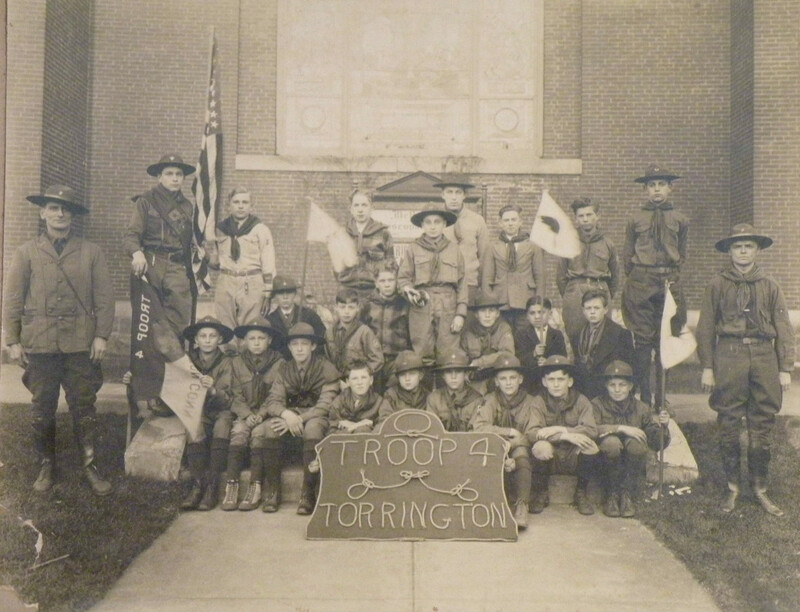 The photo below shows Troop 4 in front of the Methodist Episcopal Church in Torrington, during the 1920s. Note the variation in uniforms between the Scouters and the boys, as styles of uniforms transitioned during the early 1920s.